The most visited city in Poland, Krakow, was one of the towns that I loved during my Europe trip. There are many amazing Krakow points of interest. In this post, I want to mainly share all the free things to do in Krakow, because, well, who doesn’t love free things? Krakow is very cheap compared to all other European cities. So apart from the free attractions, there are other things to do in Krakow obviously, which I have covered in the next half of this post. 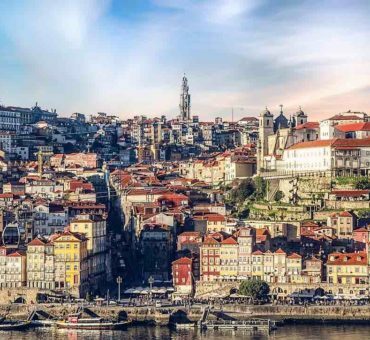 So go ahead and find out how to spend your time in one of the most beautiful cities in Europe. Interesting Krakow Facts – Why Visit Krakow? How many days in Krakow? Check out the heritage underground Wieliczka Salt Mine. How to get to Krakow? Krakow was the capital city of Poland during the Polish dynasty rule and even before that. So it’s been an important city not just in the history of Poland but also in European history. Krakow was one of the few cities that survived WW II. Hence most of the old town area include buildings and monuments dating back to even medieval times. The highest number of tourists visit Krakow, more than any other Polish City. Krakow was one of the central administrative cities during Nazi rule. After they constructed the Auschwitz-Birkenau concentration camps and turned it into a centre house for massive killings, Krakow became an essential point of operation. All of the Jews were driven out of the city erasing any trace of Jewish settlement at this time. You find the remains of this part of history in the Jewish quarter. The entire Krakow old town area got listed under UNESCO world heritage site and is one of the top things to see in Krakow today. What to do in Krakow? To answer this in parts, let me first tell you about all the free things to do in Krakow, that is fun and interesting. Among the best things to do in Krakow is exploring the ancient Royal route. The Royal route as the name suggests consists of a path passing through various historical monuments and areas. It used to be the route where royal processions and parades appeared. One of the top things to do in Krakow is to explore all the important things along this route, which you can do for free. The Royal route starts from one end of Krakow old town, and you can go all the way up to the Wawel Hill, where the road ends. You could start with the old town, which is the heart of Krakow and is among Krakow top attractions. Krakow Market Square or Rynek Główny is the largest medieval market square in Europe. I loved visiting the main square both during the day as well as night, and I must admit that the square feels entirely different both the times, in a good way, of course. This UNESCO-heritage listed area is home to Krakow’s ancient monuments belonging to medieval times. Today, you can see many swanky bars, cafes, restaurants and souvenir shops alongside the square across the streets. Among the predominant structures is the Krakow Cloth Hall, a medieval-style market adorned with traditional lights, the Town Hall Tower, centuries-old Church of St. Adalbert and Saint Mary’s Church, two churches from the 13th century. The beautiful historical structures made of Kamienice or Polish bricks today boasts of souvenir shops and cute shops. During summer and on sunny days the rest of the time, you’ll find many people scattered around the square, just enjoying the sun. While exploring Krakow market square, the Cloth Hall is something that grabs your attention first. I just loved how medieval it feels, while walking inside passing through all the souvenir shops. This 13th-century elegant structure was where the cloth merchants sold clothes from around Poland and outside. It is one of the oldest medieval structures in Europe, and it certainly feels medieval being here. As you wander through the old town area in the main square, make sure you look below. Today an underground museum, Rynek will take you back in time, with its old chambers consisting of old markets. It is a treasure of the past, which was made available to the world only recently. Rynek is also the place to find out the old Krakow and its importance in history. You’ll see that there are many churches in Krakow. There are a hundred couple of them. You’ll find the ancient ones in Krakow old town. Among them is St. Mary’s Church, older than the market square. Although it’s hard to tell that, this church is one of the impressive structures in the medieval old town. The church’s tower has a fascinating history. Every day in the evening, you can see a man playing the trumpet, a note being played from the 13th century. The guard that played was shot with an arrow killing him instantly. As a result, the guard stops playing mid-note even today. For free, you can get to the top of this tower and get great views as well as say hello to the guard. Krakow Town Hall is another ancient structure in this part of the old town. This place has been rebuilt many times, and the only original structure is the adjoining tower. The views of Krakow from the top of the tower is something that you shouldn’t miss at all. And the best part is that you can climb to the top of the tower for free. On one side of the old town at the beginning is St. Florian’s Gate, which leads to Barbican or the outer fort built around the old city. This old gate was a gateway to the town, protected by the Barbican, and as you can walk through the streets, you can see how strong these defensive units have been built. It is the only remaining gate among the eight gates that once surrounded this area. Both these ancient ruins of Krakow are free to check out. Planty is the park around the old town, and today it’s one of the coolest places to hang out in Krakow. Spreading for over 5 acres going around the park is one of the fun things to do in Krakow, and of course for free. In good weather, you can see artists performing, musicians and many local groups. There are many small gardens in this park, and my favourite was the one with lots of flowers. Okay, not everything is free in Wawel hill, but you can visit many places here without having to spend a penny. Plus it id one of the top Krakow activities, and you see people on walking tours here. On the banks of the Vistula lies this hill, home to prominent buildings including medieval fortification. Once home to Polish monarchy, today it’s one of the top attractions in Krakow. Wawel Hill consists of many historical monuments, and you can spend a day or exploring them. The ones you shouldn’t miss checking out include Wawel Castle, Wawel Cathedral and the Dragons Den. Wawel Castle is an impressive castle with a rich history and architecture that is now a mix of Renaissance, Baroque and medieval styles. It is free to enter the extensive gardens or the exteriors of this UNESCO heritage site listed castle. There is a museum depicting the history of the Polish royalty that ruled from here. Some sections of the interiors of Wawel Castle are free to enter too. The castle opens as early as 6 AM, so if you are a morning person, you can make the most of this best time. If you want to get the best captures and views of Wawel Castle, go to the Debnicki Bridge on the other side of the river, which can be reached by walking along the bed. The Wawel Cathedral within the premises is another free and worthy to visit attractions in Krakow. For other attractions like the Royal Tombs, the Sigismund Bell Tower and Cathedral Museum, you need to buy tickets. Dragon’s Den is a cave with a monster-legend behind it. Believed to be home to dragons, you can check out the entire underground area for some fun. As I said earlier, Krakow has a dark past with Jewish horror. Once the Jews were driven out of their homes, they were sent to the Ghetto areas, which were confinement areas with huge walls around them. The Ghetto was a temporary living space for them, where they were tortured before eventually being moved to the death camps. Today, some fragments of the Ghetto wall remain, with inscriptions on the wall recollecting the events that happened here during the WW II. You can trace the wall on Google maps as a part of your Krakow sightseeing. Try looking for Ghetto Wall Krakow, and you can find the areas. Not one of the better Krakow sights I know, but this is one way of freely getting to know Krakow’s history and its people. Kazimierz is the area in Krakow where the Jewish community thrived for hundreds of years. There are some free walking tours in Krakow, which also include a Jewish walking tour that would take you through the past. You can also visit the area by yourself, which include some UNESCO heritage sites like Szeroka Street, Nowy Square and much more. Known as the Jewish Square, Plac Nowy was a gathering place for the Jews for business and social life during the times when they resided in this part of Krakow. Today, Plac Nowy has some cool cafes, restaurants and bars that are less touristy and cheaper too. Szeroka Street is the main street that leads to the Jewish Quarter, and there are a few heritage monuments, with the critical attraction being the Old Synagogue. It was built in the 14th century, and the synagogue has witnessed centuries consisting of wars. A part of it is a museum showcasing its history. There are other two smaller synagogues Remah and Poppera. Next to Remah is the Old Jewish Cemetery, built in the 15th century, where several prominent Jewish personalities are buried. Kopiec Krakusa is a small hill in the Podgorze district in Krakow. If you are a nature lover, you would love taking a short hike to Krakus Mound as it is also known as, from where the views of Krakow are astounding! You can reach by taking a tram from the old town, which stops at the foot of Kopiec. Poland is home to many great universities, and Krakow is a central medieval city, is expected to have a few of them! The Jagiellonian University in Krakow is one of the oldest renowned institutions in Poland. The university houses a historical museum, which houses some of the oldest artefacts in Poland. The museum is paid, but the beautiful botanic garden in the university is a lovely place that can be enjoyed for free. The botanical garden is enormous, with an extensive collection of plants from across the world including large glasshouses. Walking around the garden itself is a relaxing feeling, especially during the summer evenings. If you want something similar to an Opera experience, head to Juliusz Słowacki Theatre, of course, you need to pay to watch any performance, but it’s free to check the theatre. When the weather is pleasant during the evening, the theatre is a cool place to be with all the lighting. If you are wondering what to see in Krakow, or what’s more to the city, another free thing to do in the city is to stroll in the boulevards along the Vistula river. This sprawling area is very famous among the locals, and you can find many people cycling, having picnics, and relaxing along the riverbank. Water trams and boats leave from the port along this boulevard, which was designed to be a green space as well as an elevation to prevent floods. It should be one of your top things to do in Krakow, especially if you love doing not much! One of the best and of course the cheapest ways to check out Krakow tourist attractions is by signing up for all Krakow free tours. These are guided walking tours, which you find in almost all of the cities in Europe. In Krakow, there is Old town tour, night walking tour, alternative Krakow tour, contemporary Krakow tour, Krakow Jewish quarter tour and Communist Krakow tour and many food tours. Most of these are free; in fact, the food tour is the paid one among all of these tours. So check out for these guided tours in the old town area or your hostels/hotels for the timings. I attended all of the free walking tours by Walkative, in all the cities of Poland that I traveled to including Warsaw, Gdansk and Wroclaw. The guides were excellent, and I got to know so much from these local experts about not just the places, but what the Polish also think of them. Like other cities in Europe including Poland, you can visit museums in Krakow on their free days. Every museum allows its visitors to check out the museum for free one day per week. Not surprisingly, you find these days to be too crowded for this reason. Most of the times, you’ll still need to pay for the audioguide, although in some places even that’s for free. I have researched for you, and these are Krakow free museum days. But do check individual websites to verify before you plan, as they may change the timetables. Oskar Schindler was a German factory owner in Krakow. During WW II, he saved the lives of over 1200 Jews by employing them in his factory. Today this factory is a museum depicting the events that followed during this period, and also give glimpses of lives of Jews in Krakow. It is arguably the best museum in Krakow. Schindler Factory Museum is free to visit on Mondays except for the first Monday of every month. Krakus is an artificial hill and is believed to be the resting place of King Krakus, the mythical founder of Krakow from which the city got its name. The mound is the oldest structure in Krakow dating back to prehistoric times. You can go to the top of the hill to get fantastic panoramic views of Krakow from the highest point of the city. Probably a cool Instagrammable place in Krakow, Tatrzańska street in Podgórze is a hippie area. Look for 55 vibrant stairs, called popularly as Rainbow stairs, painted in various colours. It is hard to miss this place as youngsters hang out for their Instagram shot. It is located next to Park Bednarskiego and St. Joseph’s Church, again two attractions worth visiting as well. Tyniec Abbey looks more like a castle than a small monastery. Situated on the banks of Vistula, Tyniec Abbey is a historic village built using limestone. The imposing towers on the top of the cliff make it lovely. This medieval-style village dates back to the 11th century. It is one of the few places in Krakow to go off the beaten tourist attractions. Nowa Huta was a small, symmetrical model city constructed by the Soviet Union in Krakow during their communist regime. As such, you don’t find Polish people popularising this place. But this is indeed a beautiful part of Krakow because of its perfectly symmetric architecture and unique layout. Ojcow National Park is the smallest national park of Poland. But it offers more experiences than you can enjoy in just a day. 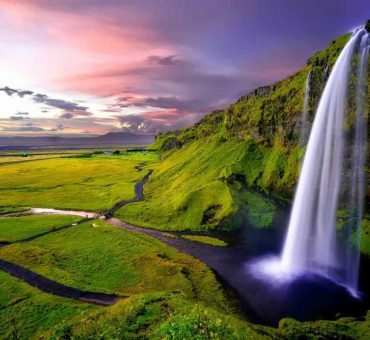 Consisting of castles, caves and many fascinating trails, you can easily spend a day or two wandering in this beautiful park. Don’t miss to check out unique rock formations in the park, famously known as White Hand Rocks. Zakrzówek is located in Dębniki was once a quarry, but now the space along the white cliffs houses a lake, which is very pretty. As it is one of the unusual Krakow things, don’t be surprised if you don’t find many tourists. You can enjoy Krakow’s ghostly side by opting for one of the quirky walking tours – Night Ghost Tour. The local guides will take you through the historic sites notorious for haunted spirits and deadly ghosts. No matter how much of it is true or not, this is undoubtedly an exciting thing to do in Krakow. Did you know that Poland is famous for its handicrafts? Yes, not just that, Krakow is the place to shop for these hand-made products perfect for souvenirs. Go to Bonarka City Center or Galeria Krakowska Shopping Mall to find the best ones at affordable prices. I told you that Krakow is the most visited city in Poland earlier, and now you probably may know why it might be right. Given this vast list of Krakow attractions, it takes quite some time if you intend to explore all of them. Ideally, you should keep 3 or 4 days to leisurely tour Krakow. What if you have less time? Check out below to see how you can make the best. Twenty-four hours in Krakow would leave you time to explore old town in detail. For best use of your time, opt for the first batch of free walking tours, which would take you through the highlights. The old town tour also takes you to Wawel Hill, which means you could see more. Then you can use the time to visit other attractions, maybe one or two museums. Spend your first day following the above itinerary, but maybe more leisurely. You can use the 2nd day to take Auschwitz or any other day trips. Alternatively, you can visit museums or check out other free places like the mound, parks and gardens including the Vistula Boulevard for a relaxed ending to your Krakow trip. Three days in Krakow would give you two days to explore most of the above attractions. You could use your third day to plan a day trip to Auschwitz or Zakopane(if the weather is great). Auschwitz is the place where the most gruesome concentration camps of WW II were created, which became the death factory. It’s not a pleasant day trip to take from Krakow, but history is to be known. However, I would suggest you avoid it if traveling with young children. You can do an Auschwitz tour on your own. It is the cheapest option. You have to take the bus from Krakow to Auschwitz, and explore the campsite by yourself. There are many Auschwitz tours from Krakow offered by many local tour companies. Alternatively, you could opt for any of the guided, inclusive Auschwitz tours below. Wieliczka is a UNESCO-protected 13th-century salt mine consisting of subterranean tunnels. Open only during the summer; this underground mine would take you through the deep tunnels leading to the mines and the only underground chapel in the world. A must-visit if you are traveling in summer. If hiking, mountains and nature interests you, You’ll love Zakopane, home the majestic Tatra mountain range. Zakopane has developed to become a resort town with many activities that could be enjoyed according to the seasons. In the summer, you can go hiking along the many trails, take the cable car to the top to admire some stunning views of the snow-capped mountains. And is one of the top city breaks to Krakow. If you are here during the winter, you can indulge in skiing, snowboarding and more. No matter when you travel, Zakopane is a great day trip option(or more) from Krakow. There are plenty of opportunities to reach Zakopane. Bus to Zakopane from Krakow is very cheap, and many buses run from early morning till evening every day. Poznan itself deserved to be explored separately, but when it’s not possible, you should include the city as a day trip at least. Check out the beautiful old town of Poznan, the Royal imperial route and the medieval churches. Cezar Castle is one of the best places to visit in Poznan. A guided tour would cover all the major sights, or you could do one getting on the train or a bus and back. Stolowe Mountains National Park is a great day trip option from Krakow for people looking for hike and nature. Beginning from Karlow village, you could trek up to the famous rocky city on top of Szczeliniec Wielki. The views from the highest point are more than rewarding. On the road, make a stop at the Skeleton Chapel in Czermna, built of human skulls and bones. Torun is the birthplace of Copernicus and is famous for this reason. But the town is lovely with many attractions worth checking out as a day trip. The Torun old town is compact and pretty, which is a part of UNESCO world heritage site. You get a beautiful view of Torun atop the Bell Tower. Don’t forget to try Gingerbread, a dish for which Torun is famous. There’s also a museum of Gingerbread, something to check along with Copernicus Museum. If you are looking for a non-touristy city in Poland to explore, one of them for sure is Lodz. This pretty town is well connected with Warsaw and offers you a genuine experience. Comprising of a small old town area, lovely neighbourhoods with milk bars, cafes and restaurants, you can slowly spend a day checking out them. There are also some cool places for shopping. One of the largest cities in East Poland, Lublin is a great city to explore for a day. There are plenty of trains as well as buses, and it takes about 3 hours to travel from Warsaw. Unlike Warsaw, Lublin has survived the darkest periods in Polish history, which means more of enriching original historic monuments and sights. Some of the places to visit in Lublin are the areas around the main street Przedmieście consisting of many cool things, Lublin Castle, and Zamoyski Palace close to Lublin in Kozlowka. Krakow is well connected to other cities in Poland and significant cities in Europe. Depending on the town from which you arrive at Krakow, you can choose from the options below. Flights – Krakow has an excellent international airport – John Paul II International Airport, to which many carriers fly. Krakow airport is the main airport in the city, and many flights of Ryan air, Polish airlines, Norwegian airlines and others offer cheap flights to Krakow from different European cities. The prices depend on the day and time of the plane of course, along with the seasons. It is highly possible for you to get a great price if you plan and book your tickets early. The next closest airport is located at Katowice, which is not exactly close. There are multiple, regular flights from Warsaw to Krakow, Wroclaw to Krakow and from neighbouring cities. Trains – The next best option and also a cheaper alternative is to reach Krakow by train. Poland has an extensive and excellent train system, in varying prices and comfort levels. The train station in Krakow is Kraków Główny railway station. You can easily travel by train from Warsaw, Gdansk, Wroclaw, Poznan, Lodz and almost any bigger cities in Europe. For trains from neighbouring towns of other countries like Prague to Krakow, Budapest, Berlin, Dresden and others, check here on the website for availability. Buses – Compared to trains, the option to reach Krakow by bus looks still limited, although there are some operators, both domestic and international. Flixbus operates from bigger cities. 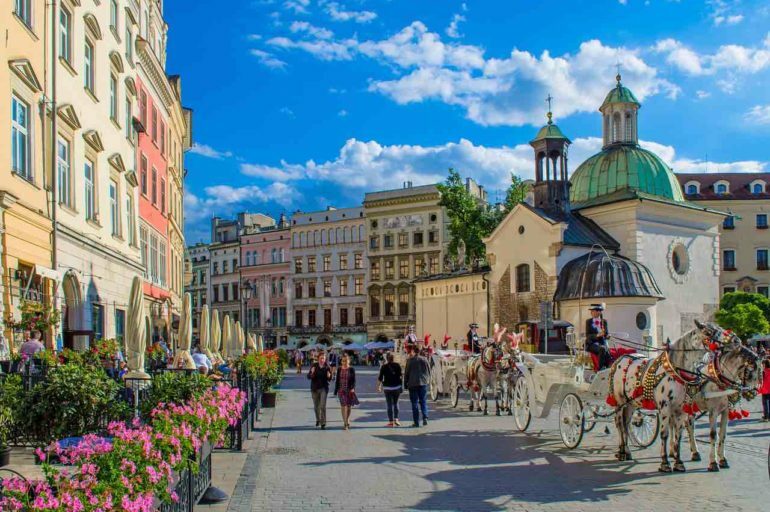 You can quickly get a coach from Warsaw to Krakow, which gives you flexibility. The central bus station in Krakow is Bosacka bus station. Luckily, most of the attractions in Krakow can be covered by walking. But getting around the city is also easy, thanks to well-connected trams, buses and metro. Depending on your stay and how far you would go, you can opt for daily passes. The best option would be to buy a Krakow travel pass or Krakow transport pass. Note that both are different. Krakow travel card comes in periods of 24 hours, 48 and 72 hours or 1,2 and three days, where you can get discounted admission to many attractions and also a few of them for free. You can use public transport with this pass. Krakow transport card is just for traveling within the city and gives you unlimited access to trams and buses. There are regular buses along with a night bus to go from Krakow airport to city centre. There is also a train to Krakow train station from the airport. The areas around the old town are the favourites among the places to stay in Krakow. Top hotels in Krakow are located in these neighbourhoods, many just across the central old square. You can get to experience the best of Krakow by picking hotels in Krakow old town. Check the map below for the best hotels in Krakow.